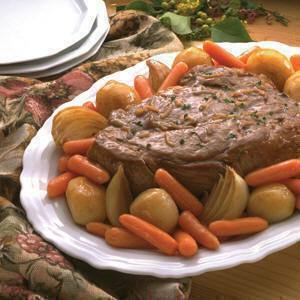 In large crock pot, add ½ can beef broth, minced garlic, and onion, sliced. Allow to cook on high for 15min. While cooking combine ground pepper and seasoning salt on a plate. Rub the pepper and salt mixture on the roast. After 15min. add cut potatoes and oregano. Allow to cook 30min. on high. Add roast and other veggies. Allow to cook on high another 1-2 hours, then turn to low for remainder. Time will vary, so check every half hour to see if meat is tender and falls apart easily.